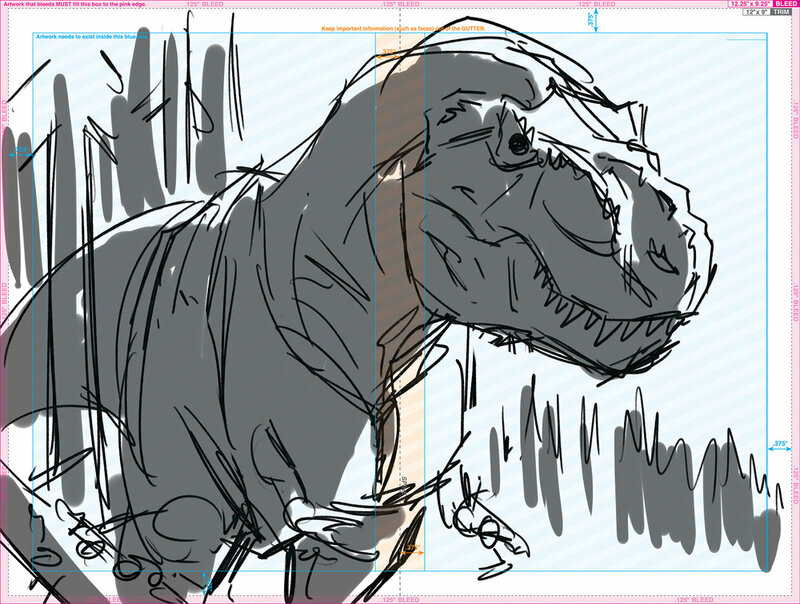 One of the biggest challenges I find as a comic creator is in designing a cover layout. Days, months, years are spent looming over a desk, crafting a story. When it’s all said and done a singular image is what stands before a body of work exhibiting a portion of one’s life dedicated to a thing… and the universal flipping of the cerebral switch determining interest or disinterest. This can be the ultimate judge in the deeming of success in our cultural ether. 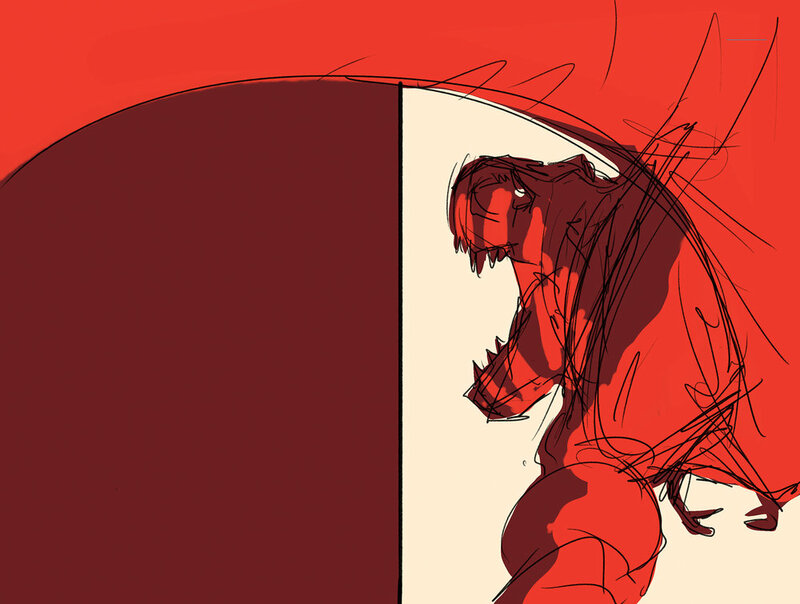 To boil it down… that cover’s gotta’ pop…. Shake… and then bake (“Piss excellence!” -Ricky Bobby). 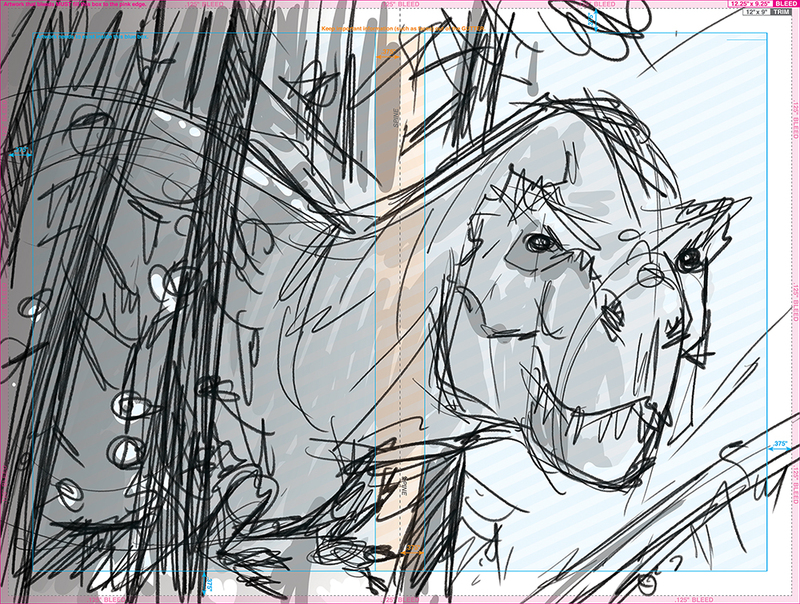 When coming up with a cover for Cretaceous it was a process to say the least. I wanted to encapsulate the overall tone and feel of the story and not just provide something that was flashy and eye-catching. And so began the purging of thought. After several rejected ideas, finally a concept was approved. Originally the intent was for a wrap-around cover, but a singular image ended up getting the overall “thumbs up” of the editorial census. Since the interiors were so art dominant I wanted the over to be a minimal and utilize warm colors. Don't ask me why I felt it needed to convey a degree of warmth, cause I have no idea. I was once talking with favorite cover artist of mine ( I'm not going to name drop, but lets just say he's a design beast!) and I asked him his "process" and "what preliminary research he does for design?" Straight up said in an unenthused and labored voice, "I just go with whatever idea pops in my head." So maybe he's a savant and just a natural talent that seems to show no limits. I am not however, but for once just went with what popped off in my head.... And here we are. Now time to make the donuts; the production stages. Cretaceous arrives in store March 26, 2019. So we’re four months away from the epic day, but preorders are currently available. If you are unable to wait till then and want an advanced viewing, register over at Net Galley, but the catch is you have to leave a review (I’m trying to get that 5 stars, so be a pal). Last, but not least, the website (this website) will have a storefront coming soon with books and art to be available. And my web-comic, “The Backwoods” will be returning as well as another web project that is currently in production. I’m finishing the entire thing before posting, so there are no delays and it remains consistent with panels posted daily on social media and pages posted weekly. It’s something… different.